I own a 2000 Honda Accord EX sedan, A/T, 4 cylinder. On hot days and / or longer drives the oil pressure light starts flickering at idle. Initially, the mechanic tried a thicker conventional oil ( 10W / 30 ) thinking that might help. No luck. Same result. I recently had several repairs made on the car including replacing the oil pressure switch and oil pump. The oil pressure light started coming on at speed. The mechanic went back to the 5W / 30 synthetic blend oil after replacing the oil pump. No luck. Same result. What could be causing the oil pressure light to continue coming on at idle after these repairs ? BTW, the engine seems to idle rough and maybe noisier when the oil pressure light starts coming on. Could the idle being too slow cause this ? ( BTW, the air control valve was also recently replaced ) What else could be causing this ? Thanks much for any help. P.S. Fully warmed up the car's idle speed is ~ 750rpm. It looks like the oil pressure light starts to come on when the needle drops slightly below the 750 mark. Can you "tee" in a mechanical gauge to the oil pressure gauge? photo that I took today with the car started and idling in the drive way. Poorman was suggesting you connect an oil pressure gauge to the block and measure the oil pressure. The oil pressure switch has to be removed, then you can connect an oil pressure gauge. 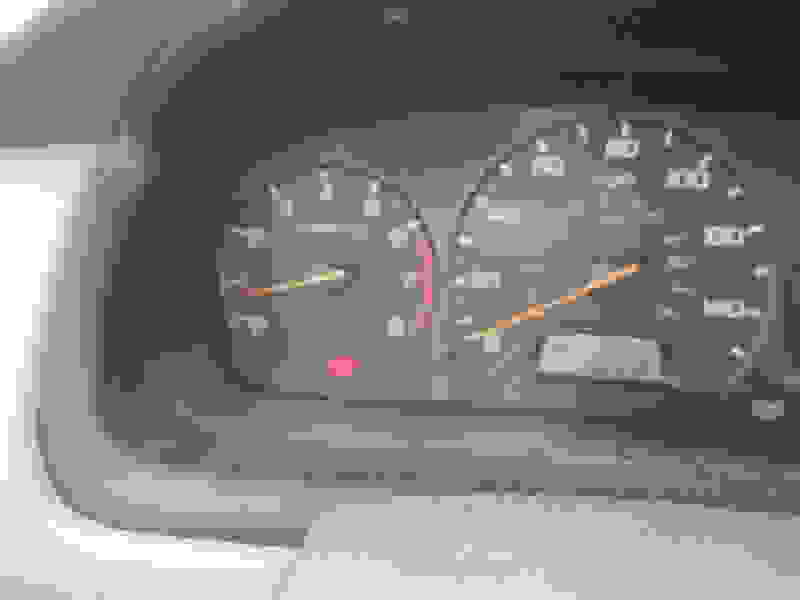 You need to know if your issue is a real oil pressure problem, or something electrical in the gauge cluster. So far this oil pressure light problem only occurs after longer driving. So, the engine would be beyond fully warmed up. Quick errands, short trips around town no problem with the light. Does this pattern tell you anything one way or the other about the possible cause ? Thanks. Measuring the actual pressure with a gauge will tell us (and tell your mechanic) a lot. The light is too simple of a system, and maybe the new pressure switch was aftermarket (vs. Honda)? With a gauge you'll see the behavior of the actual pressure during driving and maybe that behavior will be the best clue what to do next. Agreed. With only 110K miles, it really should have good oil pressure. Put a gauge on it and see what it shows. 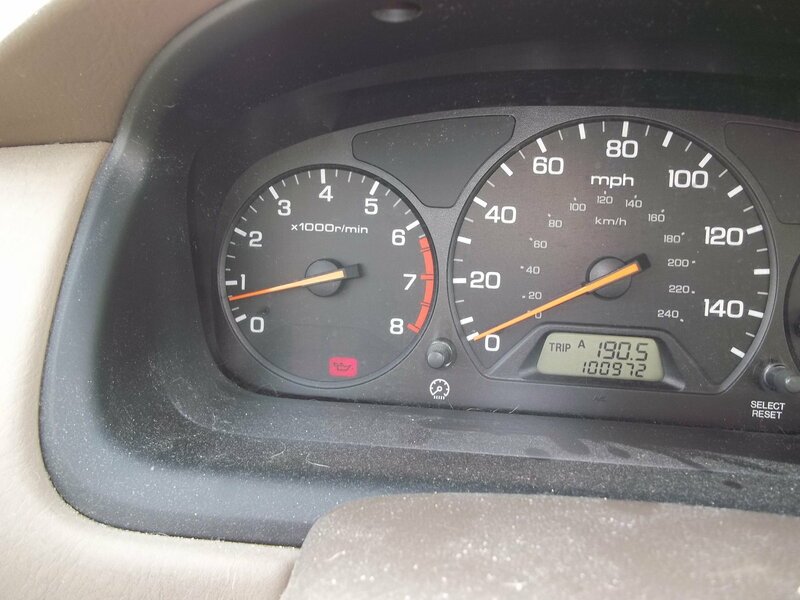 My wife's 2000 Accord 2.3L w/AT still runs fine and the light stays off after it's well warmed up. And it's got 239K miles on it. If the mechanic replaces the oil pressure switch and oil pump would you expect that to solve the problem ? If not, what else could it be ? Thanks. I thought the mechanic already replaced these items. If so, it should have good oil pressure. So, either he lied about changing the oil pump, or it has a stuck pressure relief valve (stuck open). I only say that as you have to pull the timing cover off, remove both the timing belt, and the balance shaft belt. Drop the oil pan, then remove the bolts holding the pump in place. Then remove the lower timing gear (on the crank) and pull the pump out and off. It's possible he left out an "O" ring or 2, or a gasket when he put it back together. IDK, as I'm speculating here, but that could cause a loss of pressure. It's possible that the oil pressure switch he replaced as calibrated to turn on at a higher pressure than normal too (yes, I've seen that happen before). Point well taken. He's replacing the oil pump and switch at no charge. BTW, he showed me the new pump unit. He admitted that with the previous replacement he reused the old frame / matrix of the unit and just replaced the gears. This time he will be replacing the entire unit. Would that make any difference ?